Some time ago, the Circuit Leadership Team (CLT) identified Isaiah 54:2-3 as a key passage for us. The words spoke to us. Perhaps because of the state and weight of our buildings…. For whatever reasons, the words spoke to us. As CLT, we want to invite the circuit – churches, fellowships, groups, individuals – to live with the words for a season. We want to listen for what God might be saying, to us and through us, in Isaiah 54:2-3, in the surrounding chapters, and in our shared reflection on these words. To facilitate this listening, we have a tent! More specifically, it is a large gazebo, and it will be travelling round the circuit over the next few months. This tent will be our ‘Isaiah space’, our listening post, a place for reflection, creativity, fellowship, fun. This will not be a place for holding back, but for honesty. Here we will not limit our vision, but extend it. From this base we will break forth in new ways. Here we can clear lots of ground! In this moving place we will listen for, and to, God. 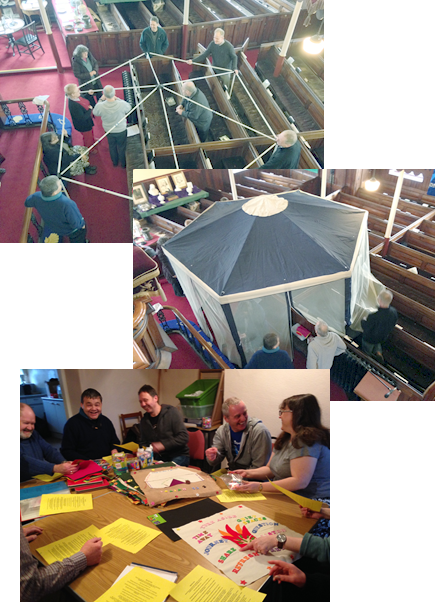 Photos show The Circuit Leadership Team building the gazebo (in the confined space of Mount Zion chapel!) and then having fun creating banners which tell a story. We hope all the churches will record their story in images. April Message from the Ministry Team.